Bending with open eyes over the shut eyes of sleepers …..
And the enraged and treacherous dispositions, all, all sleep ….. The Mesopotamians archived their dreams on clay tablets, the Egyptians wrote down their dreams on papyrus. While many throughout history have recorded dreams, at OHBM 2017 we were provided with the opportunity to view their tangible form in 3D representations of brain activity. This art and neuroscience initiative, entitled Dream Sessions, was undertaken by professional artist Nathalie Regard in collaboration with neuroscientists Roberto Toro and Guillaume Dumas. Creative pieces from Dream Sessions (both 80 Days in Dreams and 101Nights) were showcased at this year’s OHBM art exhibit, entitled “Levels of Thought”, along with artworks from other artists and neuroscientists. Nathalie Regard (NR): Hello, I am glad to introduce our new project which is kindly supported by Electrical Geodesics Inc. and The Neuro Bureau. This is a protocol that is half art and half science. My friends Roberto, Guillaume, and I are doing the piece 101Nights. For this project we’re recording EEG while I dream over a period of 101 nights. Ekaterina Dobryakova (ED): What encouraged you to do this work, and how do you combine neuroscience and art? Roberto Toro (RT): Nathalie has been keeping track of her dreams for more than 20 years, writing down every single dream as soon as she wakes up. She is now able to remember most of what she dreams. An example excerpt from Nathalie’s dream logs. With this project, we are creating a dialogue between what she does and what I do. In our first project she slept with an EEG headset for 80 nights, in continuity. I wrote a little program that played sounds – words, names of people she knows, etc. – at random times during the night. After she woke up we could read her dreams and find out if some of those words managed to enter into her dreams. Because we knew the exact time each word was played, we could get the part of the EEG signal corresponding to that part of her dream. After that, for each word that entered into Nathalie’s dreams, I did a laser cut bas relief confronting the EEG recording and the text corresponding to that part of the dream. I think the approach is interesting; it’s very different from my day-to-day activities in science, and offers me a different perspective on the data. For me, there is also a humble message: on the one hand there is such a rich subjective experience in someone’s dreams, with all those links to different aspects of what we are, and on the other hand, there’s so little that we can finally see in the data, even if we dig very deep into it. These bas-reliefs show us how far we are from reaching a true understanding of one individual’s subjective experience. NR: The protocol is to go to bed at night with a helmet of electrodes and try to fall asleep with them. ​And during the night, audios with words are launched during the early REM phases of sleep, or randomly. Eventually the idea is for the audio to merge with the plot of my dream and mix with the stories. Each day I review if what I dreamt was related to the audio I received during the night. Roberto or Guillaume (who joined the project last year), then analyse the data to build these beautiful dream fossils of very dynamic moments during which many things happen --- projects and processes, stories and biographies, old memories mixing with new memories. For the 101Nights project I am also keeping track of what I do during the daytime: the people I meet, places I go, things I eat, etc. ED: So what is it that motivated this type of work, and what is it that made you bring it to the science realm from the art realm? NR: We have worked with Roberto for many years, probably since 1995. We met in Valparaíso (Chile) and started working together for a mentor of Roberto, who was the head of the science faculty of the University of Valparaíso at that time. We discussed a beautiful book, the Theory of Colours (by Johann Wolfgang von Goethe). That was the beginning of this long conversation that continues to this day. RT: We worked on many things with Nathalie. I started making a video of Nathalie when she was doing a big mural painting in front of the pacific ocean in Chile. Later on, I recorded videos and created time-flattened pictures of Nathalie while she was painting in Paris. 101Nights is one in a series of works that we have been doing together. I really value these exchanges. NR: Part of our collaboration comes from the ability of Roberto to build a chronology of things, something that he enjoys doing very much. This has been very nice for my work, which is often related to painting very large formats, or recording dreams for very long periods. Keeping a record of these processes would be very challenging for a video camera or a photographic machine. RT: That is interesting, as my neuroscience work focuses on the study of brain development and brain evolution, so basically I work on tracking weird stuff through time! NR: So we are made for each other (laughs). RT: (laughs as well) So in addition to tracking brain development and brain evolution, I track the evolution of Nathalie’s art. I think I can add that to my CV! This project is supported by Electrical Geodesics Inc. and The Neuro Bureau, a non-profit open initiative for international collaboration, in anything related to brains and new ways of thinking about them. With thanks to Sarabeth Fox for filming, and Catherine Monahon for onsite photographs. There are over 9.9 million new cases of dementia every year worldwide, which equates to a new case every 3.2 seconds. The discovery of susceptibility loci for Alzheimer’s disease has the potential to inform research hypotheses and could, eventually, lead to novel therapies. I sat down with Marzia Antonella Scelsi from University College London to discuss her abstract on Multi-modal Imaging Disease Progression Scores as Quantitative Traits in GWAS of the ADNI Cohort. In this work, they used a mathematical model to generate an individual score for each patient based on the stage of their Alzheimer’s disease (AD) progression. Using this score, they performed a Genome Wide Association Study (GWAS) to look for any genetic markers that may be driving disease progression. Hugh Pemberton (HP): How would you explain your study to your non-neuroscientist friends? Marzia Antonella Scelsi (MAS): It is commonly known that AD is very complex and involves several different pathological processes occurring at different stages. There also exist several genetic influences but with only one very well known risk factor. The heritability of the disease is not well understood so better tools are required for studying the genetics of AD. The research world is currently looking at the genetics of each pathological process separately. However, this is likely to give only limited insight into AD, without reflecting the true complexity of the disease. Marzia Antonella Scelsi is from Bitonto, Italy, and has a background in applied Physics. She is now working towards her PhD as part of the Engineering and Physical Science Research Council Centre for Doctoral Training in Medical Imaging at University College London. HP: Why do you think your abstract was selected as newsworthy? MAS: I think it’s especially newsworthy because overall we need to look at Alzheimer’s disease from a different perspective at the moment, and in particular at the genetics behind it. Many studies to date have been quite crystallised in the sense that each study proposes slight variations on the same theme, or bigger sample sizes, thus always centering around Genome Wide Association Study (GWAS); but the imaging genetics community feels the need to integrate multiple, biologically meaningful sources of information in the underlying models, and that’s what we’re aiming to do here. Eventually, we hope our results can inform solid research hypotheses to be followed-up into the wet lab, animal models, and that could ultimately lead to benefits, speeding up the drug discovery process. We’ve found new susceptibility loci that could potentially translate into the clinic several years down the road. Our method is also unique because we used a mathematical model originally intended for basic Alzheimer’s research and exploited its outcome for translational application: first, by giving it a clinical interpretation, the Dementia Progression Score (DPS), which conveys the progression of each individual’s dementia, and then by using it in a genetic study. HP: You mentioned the susceptibility loci that you found – could you explain a bit more about this? MAS: We found 2 susceptibility loci, one on chromosome 4 that is very tightly linked to gene expression in the hippocampus and another on chromosome 22 that is related to amyloid accumulation and age-related macular degeneration, a neurodegenerative disease of the retina in the eye. So these two genes are both linked to the biomarkers that we used. HP: What relevance do you think these findings have? MAS: For chromosome 4, this finding underlines the fact that structural variation influences disease through a cascade of mechanisms and gene expression is key, so you need to intervene at the molecular level to establish a normal gene expression pattern that has been disrupted by these variants. For chromosome 22, the findings are more newsworthy because we appear to have two diseases, AD and age-related macular degeneration, that are apparently different but happen to share a genetic susceptibility locus. This means that, if we can target variation in chromosome 22 to find a potential treatment for one disease, we might be able to slow down the progression of the other, thus killing two birds with one stone, idealistically speaking! HP: What are your next research steps going to be given these findings? MAS: We’re currently working on refining this model since it can be problematic when only using a few biomarkers. We want to expand it to more biomarkers. HP: What sort of other biomarkers would you like to include? MAS: One of my colleagues has developed a reliable tool for segmentation of hippocampal subfields . Therefore, I am working on preliminary analyses to see if any subfields are differentially affected in late or early stages of AD in order to include them in the disease progression model, and hopefully achieve more fine-grained disease staging results. I’ll also add biomarkers like cognitive scores. While amyloid build-up is most likely a prodromal event and hippocampal atrophy is characteristic for mid-stage AD, for characterising later stages of disease progression I think cognitive scores are the best choice. The aim is to include biomarkers from all stages of AD progression in my model. We want to characterise the full spectrum of the disease and hopefully identify genetic variations underlying the whole course of the pathology. Iglesias JE, Augustinack JC, Nguyen K, Player CM, Player A, Wright M, et al. A computational atlas of the hippocampal formation using ex vivo, ultra-high resolution MRI: Application to adaptive segmentation of in vivo MRI. Neuroimage 2015;115:117–37. doi:10.1016/j.neuroimage.2015.04.042. Many working in or with MRI know about Mark Cohen’s contributions to neuroimaging. He played a critical role in developing practical echo-planar scanning, ultra-fast MRI applications, contrast-based and BOLD functional MRI and applications of linear systems analysis to increase fMRI sensitivity and resolution. As the creator and director of the UCLA/Semel NeuroImaging Training Program Mark has pushed his students to an integrative understanding of the role of imaging in neuroscience: the use of images as hypothesis tests and the relationship between blurring, convolution, statistical error and inference from images. We spoke to Mark to find out his background and the rationale behind the neuroimaging training program. Mark Cohen (Reed Hutchinson/ UCLA). Mark is the Winner of the Education in Neuroimaging Award at OHBM 2017. Martin Lindquist: Seven or eight years ago Mark approached me about teaching a class at his annual neuroimaging training program at UCLA. It lasts two weeks and is very intensive. It’s an amazing program, allowing people from many different disciplines to learn from the ground up. Everything involved with regard to neuroimaging -- how to collect the data, k-space, acquisition, reconstruction, pre-processing and analysis -- is discussed in the course. It really brought up the skillset of the students and provided a lot of exposure to what may have been a new field. They worked in teams, developing collaborations for life as they were learning, collecting data together and working together. When OHBM started this award it seemed as if it was written for Mark. Everyone wanted to be involved in co-nominating him. We were all very impressed with what Mark had achieved. Pamela Douglas: Mark, can you tell us what gave you the idea for the neuroimaging training program? Mark Cohen: Back then it was pretty clear that there was a lot of bad science going on. It was clear to the folks at the NIH that there were problems; a lot of people came into the field without a core understanding of the type of work that they were trying to do. Because the field is so intensely multi-disciplinary it was clear that we needed to find people with means to access a lot of stuff outside their original core skillset. For about three years, starting 2002, I lobbied the NIH, and said “it’s a really expensive field to do science in. You need to set some sort of bar for the level of knowledge that people need to have!” I was very fortunate that somebody in there heard my pleas. In particular this was supported by Steve Grant, who was previously my program officer. Steve was a huge advocate for my idea. He actually went to various institutes at the NIH and got money to put together an RFP (Request for Proposals) to develop a neuroimaging training program. Amongst the things we wanted in there were that it had to be open to people being brought in from outside fields, whose skillsets weren’t traditional neuroscience. It was critical to me that it had to be internationally focussed. We were able to fund students at the US graduate level and higher. We were also able to fund international students from what they called an R-90 mechanism. So, you could actually take in students and give them stipends from outside of the country. That was really incredibly valuable. The other benefit of the grants was an award of $100,000 a year to put on a summer program. The summer program was really our major form of outreach. Pamela (PD) was a student in the original program. Pamela: The training program is a mixture of hands-on and theory. We were able to go from a few op-amps and then to suddenly have a working EEG system. That mixture of applying everything was really effective. Was there something or someone that inspired you to be able to integrate these different mechanisms of teaching? Mark: I think we always felt in the lab that this kind of science was group science. Again, it was so multi-disciplinary – it was essential that you turn around and respect the person on the other side – whether they’re bringing you knowledge from squishy crafts like psychology or boring stuff like MR physics, or even worse, Math. You have to understand that all those domains are critical. Part of the process of learning is to understand what those pieces bring to the table, to bring ownership of their flaws, but also ownership of the fact that it’s important knowledge that’s needed in the team. When we set up the summer course, one of the fun things we did was to organize people into groups and get them to define a research question. We taught them an entire week’s worth of methods, then set them free on the scanner. I had a terrific team of people in UCLA who would sit there and make the experiments happen. So, someone would come up with a crazy idea for an experiment and some talented person like Cameron Rodriguez or Agatha Lenartowicz would write all the code, and build the devices. The students would help build these things. The students were then organized into their teams, largely by my colleague Susan Bookheimer, who would say: “we need a psychologist on this team, we need a physicist on this team, and so on”. They would run the experiments. They would analyse the experiments in the second week of the course, then present the results at the end. The learning experience was terrific but I was also intensely proud of how many people went back with lasting collaborations, people that continue to research and publish together. That was a very successful part of the course. Pamela: Do you have a favourite topic to teach, since you teach across domains? Is it MR physics? Mark: No. I’ve been teaching MR physics for 32 years. I started doing that in the context of training at Siemens medical systems. This is a true story - I have fallen asleep giving a lecture in MR physics! There’s a point at which it just spills out. For me the most important thing to teach is for people to look intimately at their data and get an eye for not only not being credulous about the stuff that’s in there, but also to look at it and say “that’s not the pattern that I expected.” There’s a frequent tendency for people to look at their data and say “it’s not the pattern I expected to see. What’s wrong with my data?” That’s “wrong-think”. Obviously the discovery comes from seeing where your data challenges you. Pamela: Do you have any advice for how to become a better educator? Mark: You need a mission involved in the teaching program. You shouldn’t be thinking just about “what is the field? How do you teach the field” But instead think about “what practical knowledge do you need?” I try to organize the course around the needs of the students in the room. The more time you spend doing it, the more the flow comes. You don’t get nervous after you’ve taught 1000 times. Also, not everybody’s best teaching is done in front of a podium. A lot of people’s teaching mode is best one-on-one. Recognizing where you’re most effective is, I think, really important. Mentorship and direct one-on-one is at one level, at least as important as standing up in front of a thousand people in a society meeting and yammering at them. Jean Chen: Amongst other achievements, you were involved in the first successful experiment to produce fMRI activation maps in the human brain (the famous cover of Science). What led you to become a neuroscientist? What would you say is behind your success? Mark: I entered college as a Music major, with an interest in performing music. Soon after, I realized that this was not the way to pursue my personal interest in music, so I switched out of that and decided to turn my attention to understanding human hearing. At that point, I became invested in Neurophysiology. I did a lot of classic lab work in neural labs, learning about electrophysiology, dissecting animals, attaching nerve endings to electrodes and so on. However, I became unhappy with that work for a number of reasons, most importantly because my interests were more cognitive rather than physiological. This was at a time (early 1970’s) when the whole field of neuroscience was suffering from the theory of behaviourism (John Watson, B. F. Skinner), which defined all behavioural science only in terms of inputs and outputs, discredited the idea of there being something conscious inside the brain. It left me disaffected with the field and switch into Electrical Engineering, which embodies another aspect of Music. I entered Electrical Engineering (MIT) with an interest in musical applications. But over time, I re-entered Neuroscience, completed a Master’s in Human Biology (Stanford), and then a PhD in Neuroscience (Rockefeller University). My early work was in classical neuroscience, but as I became more aware of the technology surrounding neuroscience, I realized that I could attach electrodes to every nerve in a rat and still have no idea how it feels. So, after my PhD, I went on to work on medical technologies, since I have the right background (Engineering and Neuroscience). I had an idea to build small bedside instruments like physiological monitors. To get experience, I took a job in MRI -- but thought it wouldn’t last because the MRI was so impractical, so incredibly expensive and slow (chuckle). I spent a long time working at Siemens MRI but realized we could do better with MRI. So I spent virtually my entire time to try to speed up MRI. We made some really good progress fast 3D imaging using modifications of the FLASH sequence. Then I went on a conference on fast imaging (run by E. Mark Haacke), and heard Richard Rzedzian and Ian Pykette on EPI (echo-planar imaging) of the heart. EPI was very grainy, low resolution of the beating heart that electrified me. After that, I quit my job at Siemens to go work with these guys on EPI. Their big interest was cardiac imaging, and I took over as Director of Applications for their company. I invested a lot of time on developing brain imaging applications (since 65% of MRI applications were in the nervous system). We took the special resolution from 4.5 mm to 2 mm with negligible scan times, and built up the protocol for brain imaging. I was in charge of translating this technology, and was fortunate to have hooked up with the MGH group (Bruce Rosen, Arno Villringer, Van Wedeen). We developed the first practical diffusion MRI by using EPI. We started on tractography, but then we got interested in perfusion. Jack Belliveau had suggested that EPI could be used for fMRI applications. Jack came to our Lab on Advanced MRI, and we did first fMRI experiments (Robert Weisskoff, Jack, Bruce, Arno). We shot some contrast in our volunteer and got our first fMRI images. Every single person in the room had understood what had just happened --- we had a way to look into the human brain. It was a huge door opening -- all the things I had wanted to do, I could finally do! It was a combination of serendipity and vision! After those fMRI experiments, I was hired by Harvard. As it happens, I actually had some formal training in graphic arts and had the opportunity to create the Science cover. The story about this cover can be found here. 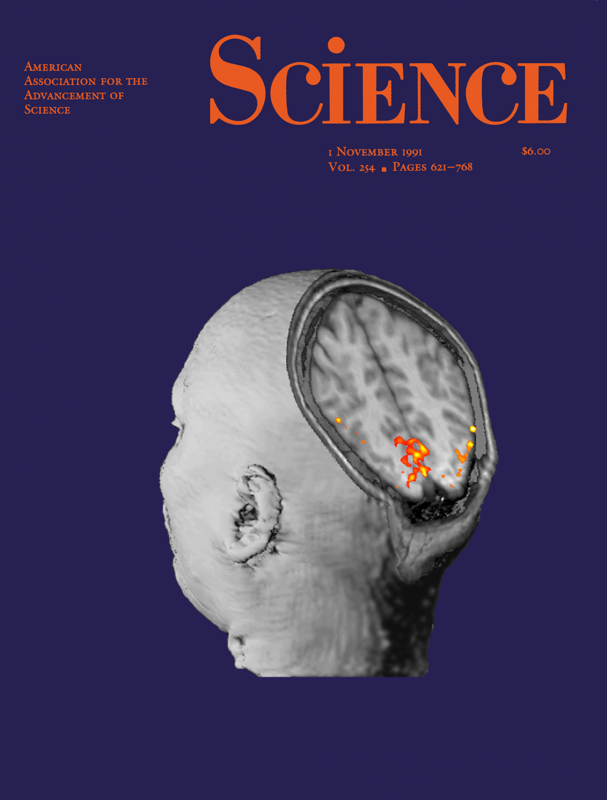 Cover image of Science Magazine --- the first fMRI experiment (Belliveau et al. “Functional mapping of the human visual cortex by magnetic resonance imaging.” Science, 1991). Jean: In this increasingly demanding and competitive research environment, can you provide two pieces of advice to new/emerging/aspiring scientists? Mark: My top advice for young investigators is “trust your instincts”. You should pursue only the things that you feel truly passionate about. I learned tons of engineering (signal processing, etc) by building guitar effects panels. Also, learning to program computers was fun so I got good at it. I became interested in cognitive neuroscience because of my interest in philosophy early in life. The passions make you skilled, and allow you to find a way to apply your skills. Jean: Finally, I understand that your current research interests go beyond neuroimaging, reaching out to astronomy and nanoscale imaging. How do these broader imaging domains come together in your mind, and what are some of the problems you’d most like to work on? Mark: I am beyond excited about sparse sampling. This work has its origins at UCLA with people like Stanley Osher, Terence Tao. The MRI community knows about this --- with a very sparse sampling, satisfactory images can still be reconstructed. However, there is a much deeper part of that --- every bit of information we receive is sparse, and our brains do a trick like in sparse reconstruction, filling in the missing information. We infer huge amounts of structures with the few pieces of information we see through our eyes. I believe there is something profound to be discovered from sparsity. My knowledge in it comes from my MRI background, but it goes beyond MRI. Most of us work in medical centres, but there are a lot of smart people around the university. Integrating my work across disciplines has brought me into Chemistry, Applied Math, Astrophysics and so on. As long as you understand our shared interests and understand the talent outside the neuroimaging world, the possibilities are truly exciting. Postamble (Jean): When I spoke to Mark for part of this interview, he was changing lightbulbs in his lab. When I conveyed my surprise at his hands-on leanings, he laughed and said it was “a normal part of his day”. Maybe his excitement at the chance to “get his hands dirty” is behind his dynamic outlook on research. Maybe that is something else that young investigators should learn from. Thanks to Mark, and to Sarabeth Fox for filming. Infants and children with a history of preterm birth (PB) and with perinatal risk factors (PRF) for brain injury may exhibit structural brain abnormalities. For example, they may exhibit grey matter (GM) lesions that could impair motor or cognitive functions. However, MRI identification of these potential GM abnormalities in infants and children is very challenging and not often employed in clinical practice. Researchers have therefore devised machine learning algorithms to identify such structural abnormalities. To better understand these new tools, I got together with Manuel Hinojosa-Rodriguez currently at the Universidad Nacional Autonoma de Mexico, who collaborates with the University of Southern California. Brendan Depue (BD): If you had to explain to your non-neuroscientist friends what your study is about, what would you say? Manuel Hinojosa-Rodriguez (MHR): Machine learning is an artificial intelligence technique that allows the computer to identify (“learn”) the relationship between given information (brain measures) and a clinical diagnosis, without explicitly being programmed to do so. Deep learning, a type of machine learning, uses neural networks that include highly complicated structures generated by examining data and then subsequently, may achieve accurate prediction of clinical diagnosis based on certain brain features. According to our results, neural networks and deep learning are promising methods for identifying relationships between brain structure and medical conditions that affect early neurodevelopment of the preterm babies. Manuel Hinojosa-Rodriguez, MD, Autonomous National University of Mexico. ​BD: Please briefly explain why machine learning is important for translational neuroimaging analyses. MHR: Briefly, machine learning is an “artificial intelligence” technique that enables the computer to automatically identify “specific mathematical patterns”, which belong to distinctive conditions. Therefore, machine learning may potentiate our abilities to distinguish different medical conditions in neuroimaging analysis. Based on neurological features — which are informative for the machine to provide accurate prediction — this will hopefully enhance or even deepen our understanding of specific medical conditions. BD: How does deep learning compare to other machine learning algorithms? MHR: Deep learning is a technique in machine learning that enables the use of “neural-network” models, which contain a significant number of processing layers. Within each layer, there exists varied numbers of “neurons” and “connections”. Each individual neuron is a function that may include a distinctive mathematical operation, which defines how the neuron can be activated/deactivated; each connection may vary in the amount of information passed between neurons of different layers. Therefore, deep learning in neural networks may allow us to build a mathematical model that defines the relationship between input predictors and output medical conditions that is far more complex than ones initiated from other machine learning algorithms. Accordingly, deep learning may help us identify more subtle or intrinsic patterns in nature. BD: Why do you think your abstract was selected as newsworthy? What is the appeal of your abstract to a broad audience? MHR: Until now, neuroimaging detection of subtle perinatal brain injury has been complicated, because conventional magnetic resonance imaging (MRI) in clinical environments does not allow us to detect microscopic lesions and does not offer relevant information about the etiology or perinatal risk factors suffered by the patient. However, by using neural networks and deep learning, it is hopefully possible to identify relationships between brain structure and medical conditions which affect early neurodevelopment. Our results reveal that brain features of preterm children can be associated with certain perinatal pathologies and/or risk factors for perinatal brain injury (see paper here). BD: Given these findings, what are your next (research) steps going to be? MHR: The next step in this project will be to examine the correlation between clinical MRI (per grades of severity) and our results. We are very interested in the accurate diagnosis of subtle brain pathologies and early prediction of motor and cognitive disabilities using conventional and advanced MRI. Figure 1. Brain regions used in determining possible perinatal risk factors.